Before I get to my card details, I have a couple of housekeeping items... First off, sorry for any of you who might have had duplicate emails or updates in Google Reader yesterday. I scheduled my post for 6 AM MST, then around mid-morning I noticed that my post disappeared, then re-posted. I'm not sure what was going on with Blogger! Lastly, I've had to turn word verification back on my comments since I've had some nasty spam this past week. Sorry for the extra step! I do read each and every comment and want to thank you for taking the time to comment. Now on to my card... I used Amber's Viva La Verve sketch, VLVNov02. The "twist" was to use the cracked glass technique. It's been awhile since I've done that! I used one of the "tree flakes" from Verve's Frosty Flakes. Instead of adding an oval panel, I placed one of my oval Nestabilities onto my cardstock and pierced around the inside of it to create my pierced oval. 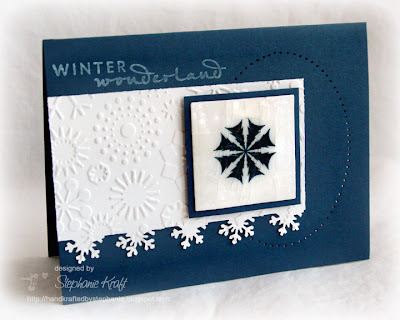 Accessories: Square Nestabilities (Spellbinders), Snowflake embossing folder (Provo Craft), Snowfall border punch (Martha Stewart), UTEE, Paper piercer, Foam tape. This is gorgeous! I love the contrast of the white against the dark blue!! Wonderful! So pretty! I love the white and blue together.